"Yi language" redirects here. For other Yi languages, see Yi people § Language. Nuosu or Nosu (ꆈꌠꉙ, pronunciation: Nuosuhxop), also known as Northern Yi, Liangshan Yi, and Sichuan Yi, is the prestige language of the Yi people; it has been chosen by the Chinese government as the standard Yi language (in Mandarin: Yí yǔ, 彝語/彝语) and, as such, is the only one taught in schools, both in its oral and written forms. It was spoken by two million people and was increasing as of (PRC census); 60% were monolingual (1994 estimate). Nuosu is the native Nuosu/Yi name for their own language and is not used in Mandarin Chinese; although it may sometimes be spelled out for pronunciation (nuòsū yǔ 诺苏语/諾蘇語), the Chinese characters for nuòsū have no meaning. The occasional terms 'Black Yi' (Mandarin: hēi Yí 黑彝) and 'White Yi' (bái Yí 白彝) are castes of the Nuosu people, not dialects. Nuosu is one of several often mutually unintelligible varieties known as Yi, Lolo, Moso, or Noso; the six Yi languages recognized by the Chinese government hold only 25% to 50% of their vocabulary in common. They share a common traditional writing system, though this is used for shamanism rather than daily accounting. Lama (2012) gives the following classification for Nuosu dialects. The Qumusu 曲木苏 (Tianba 田坝) dialect is the most divergent. The other dialects group as Niesu 聂苏 (Suondi and Adu) and as Nuosu proper (Muhisu 米西苏, Yinuo 义诺, and Shengzha 圣乍). Niesu has lost voiceless nasals and has developed diphthongs. Adu 阿都话, characterized by its labial–velar consonants, is spoken in Butuo County 布拖县 and Ningnan County 宁南县 of Liangshan Yi Autonomous Prefecture, Sichuan province, and also in parts of Puge County 普格, Zhaojue County 昭觉, Dechang County 德昌, and Jinyang County 金阳 (Pan 2001). Nyisu or Yellow Yi 黄彝 of Fumin County, Yunnan may either be a Suondi Yi (Nuosu) dialect or Nisu dialect. Zhu & Zhang (2005) reports that the Shuitian people (水田人) reside mostly in the lowlands of the Anning River drainage basin, in Xichang, Xide, and Mianning counties of Liangshan Prefecture in Sichuan. They are called Muhisu (mu33 hi44 su33) by the neighboring Yi highland people. Shuitian is spoken in the following locations. Shuitian belongs to the Shengzha dialect (圣乍次土语) of Northern Yi. According to Bradley (1997), there are 3 main dialects of Nosu, of which the Southeastern one (Sondi) is most divergent. Chen (2010) lists the following dialects of Nosu. Also listed are the counties where each respective dialect is spoken. Classic Yi is a syllabic logographic system of 8,000–10,000 glyphs. Although similar to Chinese characters in function, the glyphs are independent in form, with little to suggest a direct relation. The Modern Yi script (ꆈꌠꁱꂷ nuosu bburma [nɔ̄sū bʙ̝̄mā] 'Nosu script') is a standardized syllabary derived from the classic script in 1974 by the local government of China. It was made the official script of the Yi languages in 1980. There are 756 basic glyphs based on the Liangshan dialect, plus 63 for syllables only found in Chinese borrowings. 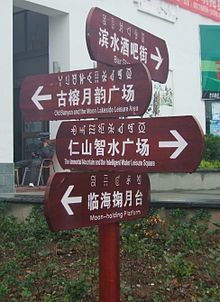 A signpost in a public park in Xichang, Sichuan, China, showing Modern Yi, Chinese and English text. The written equivalents of the phonemes listed here are "Yi Pinyin". For information about the actual script used see the section above entitled Writing System. Nuosu has five pairs of phonemic vowels, contrasting in a feature Eatough calls loose throat vs. tight throat. Underlining is used as an ad-hoc symbol for tight throat; phonetically, these vowels are laryngealized and/or show a retracted tongue root. Loose vs. tight throat is the only distinction in the two pairs of syllabic consonants, but in the vocoids it is reinforced by a height difference. The syllabic consonants y(r) u(r) are essentially the usual Sinological vowels ɿ ʮ, so y can be identified with the vowel of the Mandarin 四 sì "four", but they have diverse realizations. Y(r) completely assimilates to a preceding coronal except in voice, e.g. /ɕz̩˨˩/ [ɕʑ̩˨˩] "to marry", and are [m͡l̩] after a labial nasal, e.g. /m̥z̩˧sz̩˧/ [m̥m͡l̩˧sz̩˧] "cloth". U(r) assimilates similarly after laterals, retaining its rounding, e.g. /l̥v̩ʷ˧/ [l̥l̩ʷ˧] "to stir-fry", and is [m̩ʷ] after a labial nasal, e.g. /m̥v̩ʷ˧/ [m̥m̩ʷ˧] "mushroom"; moreover it induces a labially trilled release of preceding labial or alveolar stops, e.g. /ⁿdv̩ʷ˨˩/ [ⁿdʙv̩ʷ˨˩] "to hit". The tight-throat phone [ɤ̝] occurs as the realization of /ɤ̝/ in the high tone. That it is phonemically loose-throat is shown by its behaviour in tightness harmony in compound words. The high-mid tone is only marginally contrastive. Its two main sources are from tone sandhi rules, as the outcome of a mid tone before another mid tone, and the outcome of a low-falling tone after a mid tone. However, these changes do not occur in all compounds where they might: for instance wo "bear" + mop "mother" regularly forms wo mox "female bear", but vi "jackal" + mop "mother" forms vi mop "female jackal" without sandhi. The syntax creates other contrasts: tone sandhi applies across the boundary between object and verb, so is present in SOV clauses like mu jy lu ti shex "Mujy looks for Luti", but is absent in OSV clauses like mu jy lu ti shep "Luti looks for Mujy". A few words, like xix "what? ", have underlying high-mid tone. ^ Hammarström, Harald; Forkel, Robert; Haspelmath, Martin, eds. (2017). "Sichuan Yi". Glottolog 3.0. Jena, Germany: Max Planck Institute for the Science of Human History. ^ Pan Zhengyun. 2001. Yi-yu Adu-hua chunruan-e fufuyin shengmu bijiao yanjiu. [A comparative study of labiovelar cluster initials in the Adu patois of the Yi language]. Minzu Yuwen 2001.2:17-22. ^ Zhu Wenxu [朱文旭] & Zhang Jing [张静] 2005. "Yiyu Shuitianhua gaikuang" [彝语水田话概况]. Minzu Yuwen 2005:4. ^ *Bradley, David (1997). "Tibeto-Burman languages and classification". In Tibeto-Burman languages of the Himalayas, Papers in South East Asian linguistics. Canberra: Pacific Linguistics. Andy Eatough. 1997. Proceeding from Syllable Inventory to Phonemic Inventory in the Analysis of Liangshan Yi. Work Papers of the Summer Institute of Linguistics, University of North Dakota session, volume 41. Chen Kang [陈康]. 2010. A study of Yi dialects [彝语方言研究]. Beijing: China Minzu University Press. Collective book, Ritual for Expelling Ghosts, A religious Classic of the Yi nationality in Liangshan Prefecture, Sichuan. The Taipei Ricci Institute (November 1998) ISBN 957-9185-60-3. Ma Linying, Dennis Elton Walters, Susan Gary Walters (editors). Nuosu Yi-Chinese-English Glossary. Nationalities Publishing House (2008). ISBN 978-7-105-09050-1/H.638.